Ham may have been the goal but driving from New Orleans to Memphis involves much more than merely looking for a hunk of salty, gristly meat. Those cities and all the bayous and delta flatlands and little towns between them, the musical landmarks and the other foods, barbecue in particular, are first-class attractions even when winter grinds the color out of everything. But memories of that funky southern meat were what motivated much of the drive past the fields where they used to grow cotton and the roadside forests that prevent close looks at whatever remains of southern culture in these homogenized times. I’m glad there was so much else to see during January’s dawn because finding that little portion of protein proved to be more difficult than expected. I Googled “best places to find country ham in” whatever town was near on several occasions and was greeted with long lists of supposed contenders. I learned that there are purveyors of meat products in places like Yazoo City and Bogalusa who seem to think that country ham means pretty much regular old ham sold in the country. Not so. 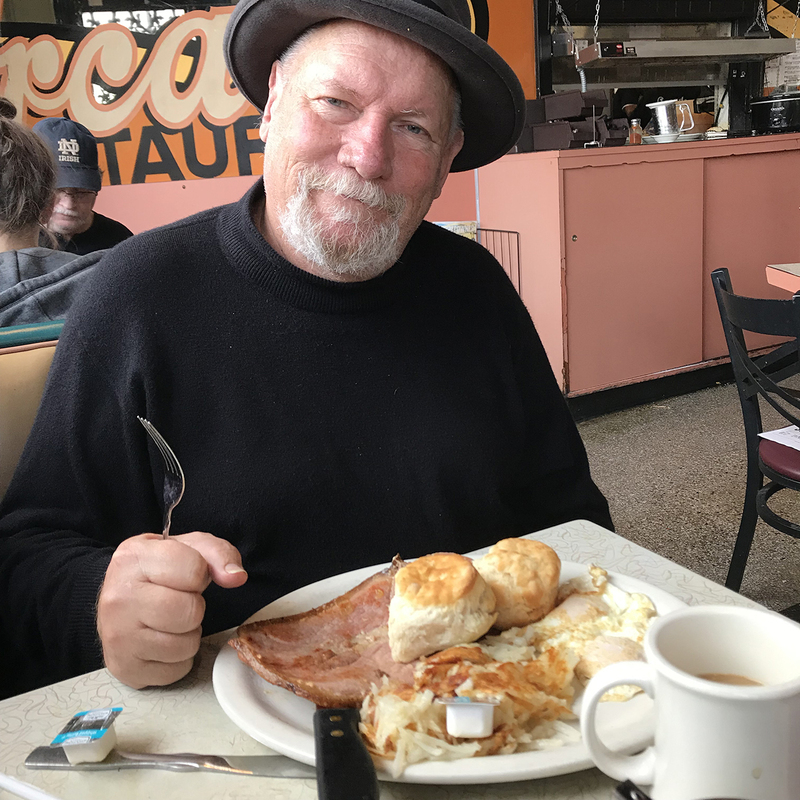 My only previous encounter with country ham, the real deal, came in 1981 while I was on a newspaper assignment in Bowling Green, Kentucky. I had ordered breakfast in your standard courthouse plaza café and said I would like the country ham with my eggs and grits. “Oh, no, you wouldn’t,” said the waitress. “Sure I would,” I replied. I’m not sure what it was about me that convinced her I was not a candidate for the real thing. It could have been the clothes. No plaid, jeans or backwards ballcap. I could have been the California voice but I found again last week that I unintentionally affect a southern accent when I get within shouting distance of a bass boat or a jar of pickled eggs. I don’t remember if she stayed and watched as I ate but I do remember the ham. Way too salty. Gristly as hell. Toughest piece of meat I had ever encountered. Wonderful. It reminded me of my one experience with a close relative of country ham, red eye gravy, a couple decades earlier. It was made by a neighbor and was thin, strong, salty and, yes, red. It made mashed potatoes better than potatoes deserve to be. Unfortunately that neighbor soon moved away. To the south, I presume. Imagine my delight upon finding country ham on the first menu I encountered on the first evening of the trip. 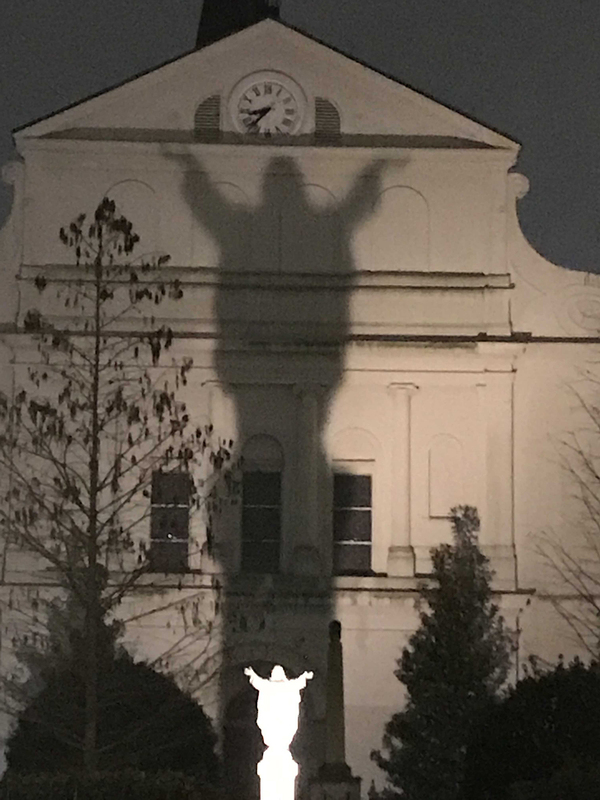 My traveling companions – two women of disparate ages, neither of whom appreciates this kind of attention – had managed to book us into a hotel in downtown New Orleans within sight of the Superdome, which was mere hours away from hosting the Sugar Bowl. While I studied the menu at trendy Willa Jean restaurant, squads of men and women in Texas Longhorn orange strolled Bourbon Street on the alert for similar units in George Bulldog red. The Texans seemed to be flashing gang signs of some sort so we restricted most of our contact to the seemingly less aggressive Georgians, whose demeanor provided an accurate prediction to the outcome of their New Year’s Day competition. The ham, though, was as disappointing to me as the game would be to the Bulldogs. It said “country ham” on the menu along with an assortment of other southern specialties, such as pimento cheese, which seems to be Cheez-Whiz mixed with who knows what. But I knew right off that this was the wrong ham. For one thing, it was pink, not multicolored, and curled up like a piece of lunch meat It belonged on a sandwich with Dijon, mayo and radicchio. The rest of the meal was fine, though I cannot recall what it was. Day two of the trip got me no closer to my quarry. Lunch for me was a tremendous plate of fried catfish with red beans and rice at the St. Charles Tavern in the city’s Garden District, an impressive display of giant mansions and other monuments to exploitation in its various forms. Dinner that night provided some wonderful prawns that, fortunately, tasted not at all like ham. We were northward the next day after brunching at a trendy food court that is attempting to help the Bywater neighborhood drag the flood-smacked Ninth Ward nearby back into modern times. I had expected signs and discussion of Katrina to surround us while we did our French Quarter ghost tours or ate our beignets, but the giant flood doesn’t seem to dominate this great city the way it once did. I was told, however, of a recent test of the city’s infamous network of levee pumps, a test that gave failing grades to most of the machines. New Orleans is a tremendous city. Continue to pray for it if that is how you are about such things. No ham of any sort at the food court. I contented myself with a tasty dish of trout and plantains. It was as salty as anything I can remember except salt itself. It smelled a little like a baseball mitt, and my grandmother’s barn and my grandfather’s shop. The next stop was Baton Rouge, another sobering display of southern disparity. It probably works out well, all those poor people available on the east side to mow all those giant lawns on the south side. I was told it is possible to find a fabulous turtle soup in Louisiana’s capital city, but it wasn’t advertised on any of the billboards I saw. Morning took us across the Mississippi and into Mississippi. On the whole, I found the state to be nicer than expected. That might have been a function of the cold weather. I spotted no sharecroppers leading mules along rutted paths. The tarpaper shacks seem to be mostly gone, too, though they could be seasonal as well. I read an article about a fancy riverside resort where the rooms are sharecroppers’ shacks that have been cutesied up with mason jars filled with flowers, rag rugs, curtains as sweet as iced tea. Instead of tarpaper shacks, the highways and byways of Mississippi today are dotted with mobile homes – plain, grey or white mobiles, devoid of ornamentation and often arranged in circles or rows ready to accommodate itinerant laborers or to be hauled off somewhere depending on the crop cycle. They’re like used car lots but for mobile homes instead of Fords. I was hoping to impose all sorts of terribly authentic roots music on my traveling companions. Much of the drive was on or near Highway 61 made important by generations of Mississippi blues musicians and made better known by a Bob Dylan album cover. We did go through the landmark places, Natchez and Vicksburg and Clarksdale, sort of, but the timing was off. There were records and bumper stickers to be purchased inside convenience stores but the clubs that Howlin Wolf and the others rattled and shook were sleeping things off on a Wednesday night in January. Natchez along the river was pretty but kinda boring what with no blues about. Like most towns and cities east of the Mississippi, it does have a popular barbecue joint but my fellow travelers weren’t up for any more southern cooking at the moment. So we opted for Fat Mama’s Tamales, which specializes in miniature facsimiles of the real thing. Miniature tamales, not miniature fat mamas. Pretty good and my ham and Cheez-Whiz Po’ Boy was a bargain. Mexican food is hard to come by in Missouri or Tennessee but tamales of a sort compete with burgers on many menus. Speaking of bargains, I have so far failed to mention the price of gas. In Louisiana and again in Tennessee, it cost $21 to fill up my rental car. Which translates to $1.75 a gallon. Slightly more than half what it cost me to fill up a week earlier at Rotten Robbie’s in Salinas. A fellow told me gas was cheaper yet across the river in Arkansas. 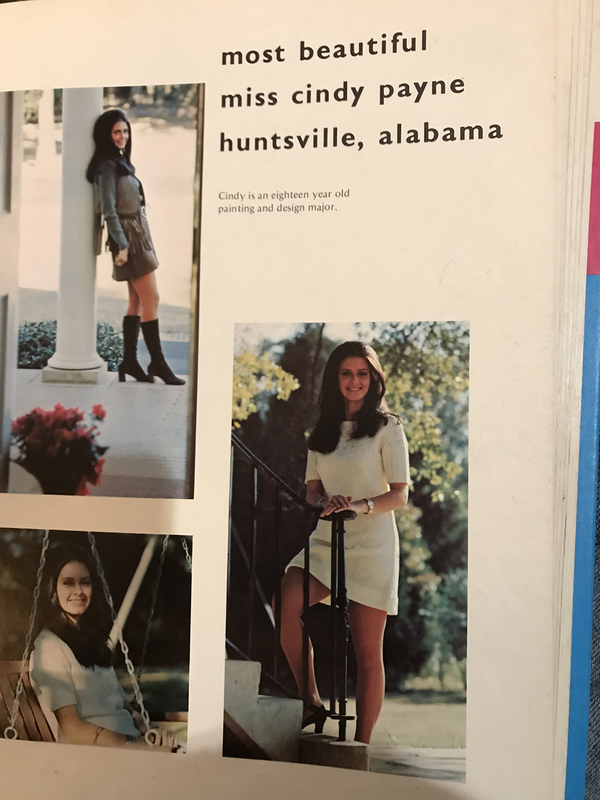 An image from an Old Miss yearbook. Continuing north, A decent slogan for the Vicksburg Chamber of Commerce might simply be “Better than Natchez.” Bigger, prettier, more music (though no blues on this night). Still, no country ham. We skirted Clarksdale to take in Oxford because we’re partial to college towns since we have many relatives who seriously considered going to college. Nice as it is, though, Oxford almost didn’t make the cut because the college there is Ole Miss, the University of Mississippi, which fought integration even more vigorously than Donald Trump fights most good things. It turned out to be a highlight of the trip. Beautiful place. Even in the dark, Faulkner’s home looked as though it could be lovely. I left the bookstores wondering why we couldn’t have such dreamlands back home. And the food. Very nice. We went to the Ajax Diner on the square. I would have ordered the ham if they had any, but no, no. So it was the oyster salad for me, thanks. Then for the storming of Memphis, as far north as our plans took us. It is another fascinating place with great food and music, interesting sites, things to do, but the core of the city surrounding downtown was worse than anything we had seen in Louisiana. When King Cotton moved out decades ago, headed to Japan or wherever, he took the heart of the Memphis with him. If you’re thinking about the decline of Detroit, you’re close. But there were good parts. Very good parts. The balcony of the Lorraine Motel, where King was killed. We drove directly to the National Civil Rights Museum at the Lorraine Motel. 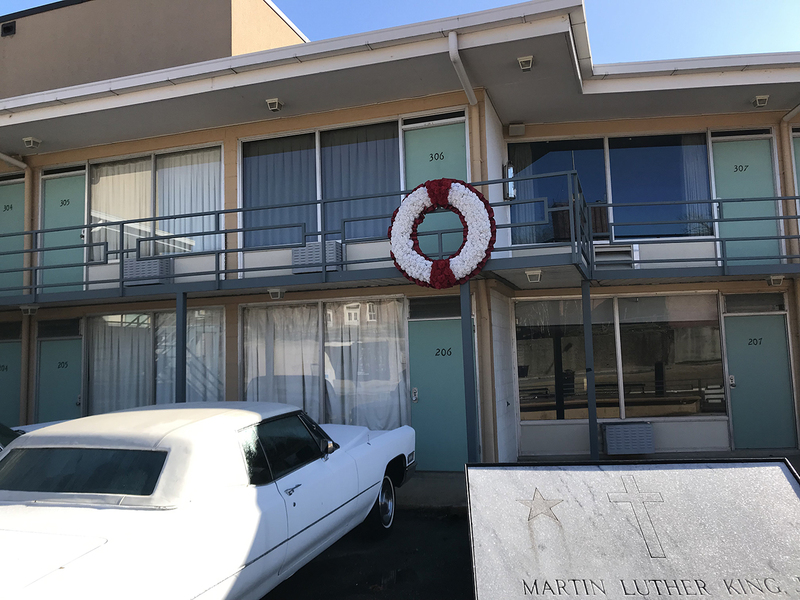 It is one of the nation’s shrines, the site of one of its greatest tragedies, the assassination of Martin Luther King Jr.
We drove into the parking lot and walked up to the familiar sign in front of the too-familiar balcony. Like many millions of people before me, I had no clue that I was about to be standing in the middle of the street crying like it had happened yesterday. The museum is superb. There is a connection with the Smithsonian, and they did it right. The displays. The layout. The thinking that went into all of it. Properly, the parking lot was filled with cars from all over the country. The tour contains a surprise. I will not spoil it here. 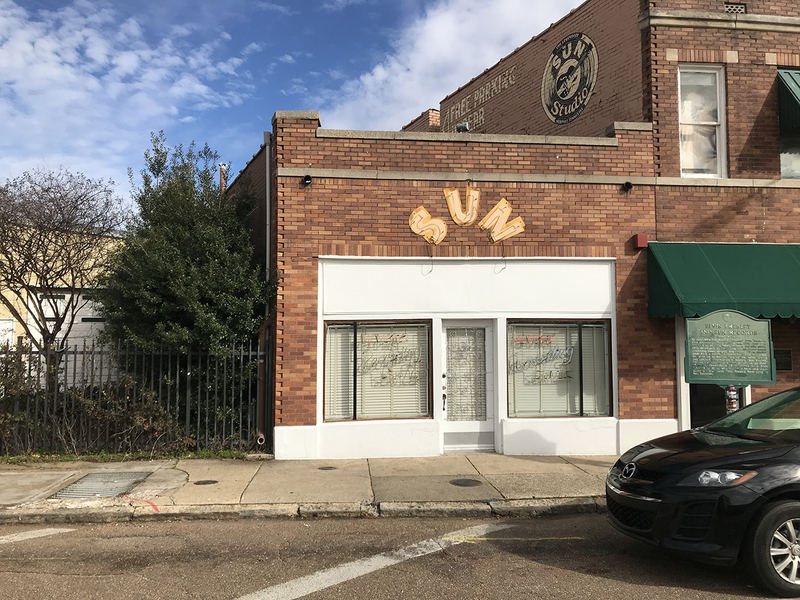 Sun Studio in Memphis, "the birthplace of rock 'n roll." It was in the same neighborhood that I found the other thing I had come for. I didn’t know it, though, until I was chatting with the owner of a little record store and we got to talking about travel and food and, eventually, country ham. “Best place in the world for country ham,” said Mark, the proprietor, pointing at the restaurant two doors down. The Arcade. Oldest restaurant in Memphis. An authentic diner from the beginning and they claim, with as much energy as any restaurant operators throughout the region, that it really was Elvis Presley’s favorite restaurant. We didn’t make it to Graceland, gratefully, but there was plenty of Elvis paraphernalia at the Arcade and everywhere else to make us not care.Elvis apparently didn’t go for the country ham at the Arcade but for the fried peanut butter and banana sandwiches. I am glad I didn’t fashion a trip around that. But there, right on the menu, “Country fried ham breakfast,” with the ham holding its proper place as an entrée rather than a side. It arrived surrounded by a couple eggs and a couple of biscuits and who cares what else. There it was. A round steak of unmistakably country ham. Probably only a third of an inch thick but larger around than a 45 rpm record. A generous portion by any measure. Royal Calkins and country ham. The color, mostly grey with some brown and a couple of other colors that maybe aren’t really supposed to be there. What country ham is is rustically cured pork that is crusted in salt and left to hang in a bag in a shed or a back porch or a barn for as long as nine months. To do it correctly, three of those months are supposed to be in the summer. It is legal for me to make country ham but not for me to sell it to you. They say the salt and the dehydration is what kills off the bacteria that were put on this earth to kill you but I’m not ready to trust one that hasn’t been blessed by the USDA. It was as salty as anything I can remember except salt itself. It smelled a little like a baseball mitt, and my grandmother’s barn and my grandfather’s shop. There was a light crunch when I chewed. It reminded me of the way a fireplace smells on a wet night. It certainly didn’t need any Dijon. It made me remember to chew slowly. It made me cough. My breakfast companions each cut off a tiny triangle that they considered eating, but they were returned to my plate. It was fine with me. How did it taste? Like the south. Like the Ninth Ward farther south. Like it did back in Bowling Green decades ago. Have something to say about this story? Send us a letter or leave a comment below.